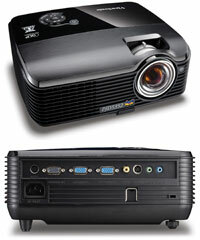 ViewSonic has started shipping its new PJD535, a portable, sub-$800 projector with support for stereoscopic 3D. The DLP-based PJD535 offers a native resolution of 1,024 x 768 (XGA), a contrast ratio of 2,600:1 (3,000:1 dynamic), and a brightness of 2,600 lumens. It can display 3D images and videos on projected areas ranging from 32 inches to 195 inches using DLP Link technology. It supports throw distances of 1.8 feet to 11.5 feet. Security features that include a Kingston lock port and security bar. AV ports include component/RGB 15-pin mini D-sub (two in, one out), S-video, composite video, and stereo minijack I/O. The projector ships with a three year parts and labor and one year lamp warranty and is currently available for $749. Further information can be found here.